Big B welcomes all and wishes Happy Navratri. He speaks if we think carefully then we realize that little happiness in our life are so invaluable to us and cites few examples – 1. Though we all wish to have lots of money but when we get a small 10 INR currency note from a old faded jeans we feel much happier equivalent to 1 Lakh INR, 2. We all wish to wear designer clothes but the maximum comfort we get in our home Pyjama and Kurtas. Moreover, 3rd pt, We all want to eat at 5 star hotels but we found more fun and merrier to eat with friends at a roadside food stall. 4. Though we have thousands of selfies in our mobile but we get more laugh when we discover an old childhood photo of ours. He suggests that Itti Si Khushi (So Little happiness) makes our life much happier and he then welcomes Neha and Aman who are the protagonists of the Sony’s new show Itti Si Khushi. 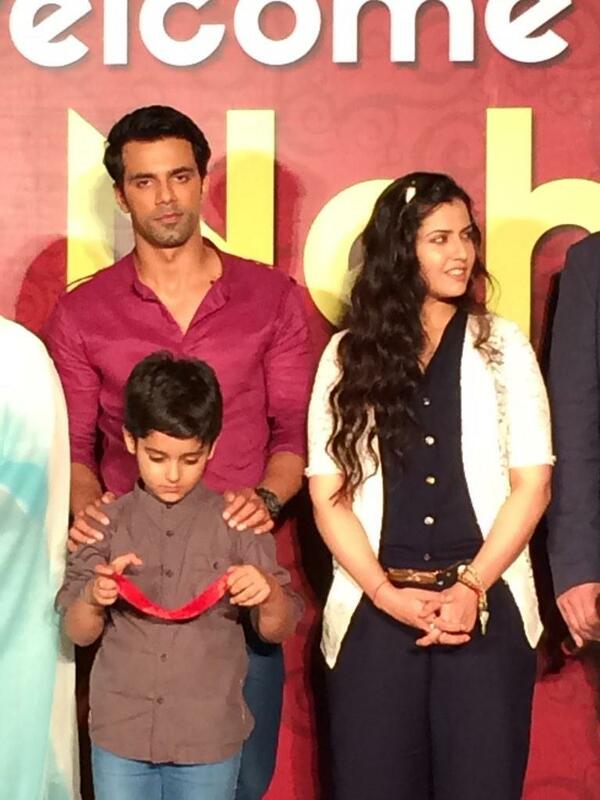 Neha is portrayed by actress Smriti Kalra and Aman is played by actor Anuj Sachdeva. Both Anuj and Smriti comes on stage and Anuj goes on to touch Big B’s feet and Smriti greets cordially with a handshake and smile. Big B speaks that the pair have so much understanding that they are far apart. If one speaks a lot other doesn’t speak at all, if one smiles a lot then other doesn’t smile. When asked by Big B, Smriti aka Neha informs on smiling always while suggests that Anuj Aka Aman doesn’t smile. Big B asks Smriti about the title of her show – Itti Si Khushi which has lot of depth and meaning. 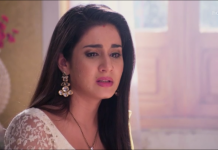 Smriti replies that the show title defines the show which focuses on little happiness which is around us, we think about future and stops to live in the present thereby losing happiness. Smriti speaks that her show is about Neha who is a 14-year old who goes into coma after having an accident while running against someone. She suggests that how she went into coma and how the accident happened in first place will be known on 29th September @ 8 PM when the show begins its telecast and smiles. Big B introduces their companion on the show Anand Agarwal (playing father of Neha in the show), Akansha (playing Neha’s sister) and also Smriti’s real mother Kiran Kalra. Big B speaks on the game format and 4 helplines and starts the question from 20,000 INR. Smriti speaks of playing KBC for a cause which is support a society SPCA (Society for Prevention of Cruelty towards Animals) and this organization is very prompt in their service though they have limitations in resources. Anuj speaks of his wish which is from childhood to see whether he is longer than Big B. Big B agrees and they stand together in an elegant pose and Big B emerges taller in height. The first question asks about loafers and sneakers in fashion and clothing and they replied Shoes and wins 20 K INR. The second question asks them which is the road which connects Rashtrapati Bhavan with India Gate and National stadium in New Delhi. Smriti and Anuj are not sure and take audience poll helpline and the audience gives max score to Rajpath which is correct but Big B creates some suspense since the audience is in Mumbai. Big B asks them how come they don’t know and even Anuj is from Delhi. Next question is an audio song and the singer is to identified and the Tum Hi song plays. Anuj replies Arijit singh after seeing the options and its correct. The sixth question asks about the format of the World kabbadi league broadcast on Sony Six and the options are geometrical shapes. Smriti first speaks rectangular and uses Double Dip lifeline which is wrong and then Anuj chooses circular format which turns out to be correct. 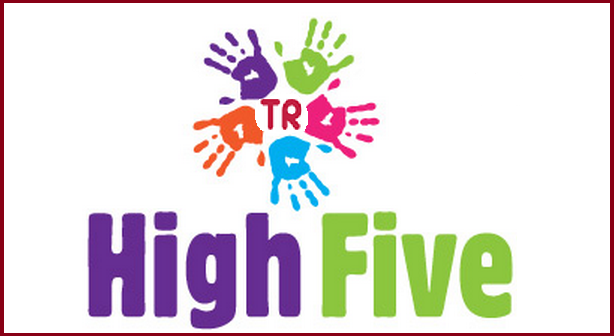 Soon, the hooter alarm ends their game and Smriti and Anuj wins 1,60,000 INR. Big B wishes them the best on their upcoming show Itti Si Khushi. and they leave from KBC. Big B welcomes Shahid and Shraddha Kapoor by referring to them as versatile and super successful actors. Big B hugs Shahid and Shraddha greets Big B. Big B speaks that Shahid has much skills in dance while Shraddha also have interest in singing. He also informs that Shraddha worked for the first time with him in his movie Teen Patti and haven’t worked with Shahid until now. Shahid responds that because of that reason of not working together he always tries to come often to KBC so as to get an opportunity to be in one frame with Big B. Big B speaks that promos are looking amazing and asks Shahid about his film Haider. Shahid replies that Haider is an adaptation of Hamlet (novel). The plot is a family revenge drama centrered on To be or not to be. Big B speaks that Hamlet is a grand novel from William Shakeaspeare. Shahid speaks that the film is based in Kashmir in 1990’s and has been adapted from the original novel according to Indian setting. He speaks that is new and excitement project. Big B ask Shraddha about the movie. Shahid steps in there and suggests that Shraddha is very nervous and she was asking before to him whether she should touch Big B’s feet during their introduction. Shahid informs that he suggested no to her and Big B then suggests that he is not suitable that someone touches his feet on a lighter note. Shraddha speaks of being nervous to appear on KBC and then speaks on working with Vishal Bhardwaj and feels lucky to be a part of the film Haider, an adaptation of Shakespeare’s Hamlet. Big B speaks that music and visuals in the promos are amazing and also praises Vishal’s film making. He then speaks that Shraddha and Shahid are playing KBC for a good cause. Shahid informs on donating KBC prize money to J&K Prime minister’s relief fund. Big B informs them that they will play until the hooter alarm. The first question asks what is the phrase when referred to someone who comes in between two lovers. Shahid and Shraddha chooses Kabab Mein Haddi which is the right answer. Big B asks them whether they have some Kabab Mein Haddi in their film not personal. Shahid replies that in movies people come in between lovers but in his personal life there is no one who comes in between. Shraddha replies that in her personal life there is no Kabab and hence no Haddi. Big B suggests that he understood what were the signals Shraddha was giving. A question asks about the traditional Goan layered desert. Shraddha chooses Bebinca which turns to be correct and Big B tries to pull the leg of Shahid by speaking that he visits Goa often but haven’t eaten Bebinca how come that’s possible ? Big B speaks that Bebinca is made up from Egg Yolk. Shahid replies that he is vegetarian thus not eaten that dessert. Big B speaks that Haider is the second movie of Shahid with Vishal Bhardwaj and the first one was Kaminey. He speaks that in Kaminey, Shahid used to say Fa instead of Sa and asks Shahid how about this movie Haider ? Shahid speaks that Vishal has incorporated Hebrew language semantics Chutzpah [quality of audacity, for good or for bad] in the movie and it has been used in Indian context. Shahid then takes out a skull and speaks that if he is not talking with Arshiya (played by Shraddha) then he does talking with that skull and calls them as love triangle bringing smiles on Big B. He speaks to the skull while holding it and with his dialogue suggests where he have been and informs that Chutzpah happened to him. He speaks that a dacoit have looted a bank and then went again to another counter with the money wanting to open a bank account and he spoke it as an example of the audacity he was referring to earlier. Next question is on which river Srinagar city is situated, and they reply Jhelum which is correct. Big B asks them about their experience shooting in Kashmir. Shraddha speaks that Kashmir is an integral part of their script and story. Shahid speaks that the entire film is shot in Kashmir and there are some locations like Zain-E-Padal bridge in down town where there have been no film shooting in the last 50 years. They shot on the bridge, Lal Chowk and film shooting were done in the heart of the city. Big B speaks of his time and reminds that during summer months films shooting used to take place there and it looks like all the film industry have came there. The next question is about the name of awards which is not name after a person, and third expert gives the answer Grammy awards which turns out be correct. One of the expert (tech) Rajeev Makhani who also works at NDTV speaks of a challenge that Shahid – world class dancer and Shraddha – an equivalent good singer and wants dance and singing from the pair and that challenge is accepted. Shahid speaks that dance he will do but Shraddha doesn’t know the lyrics of that song. Big B then speaks that even big actors doesn’t remember lyrics but does some lip sync and cites the example of Johnny Walker who used to not remember lyrics but used to do something so it looks lip sync. Big B cites an example like just sing A.B.C.D. .. in case you don’t know the lyrics. Shahid first performs on the Bismil song and shows some dance moves. Now comes the turn of Shraddha to sing and she sings Arey Aao Na… song from her movie Haider without any music and sings well. Big B suggests her to playback in her films and also inform the music directors when signing the film. Shraddha is humbled to hear those encouraging words from Big B. 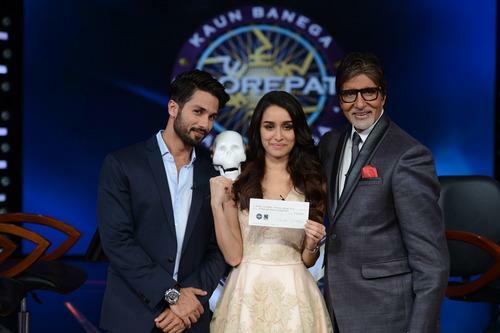 Soon, the hooter alarm is heard and KBC game stops there and Big B informs Shahid and Shraddha that they have won 3,20,000 INR which will go to Prime Minister’s relief fund for J&K. Big B signs off by saying that he wishes the situation in Kashmir gets better soon and we will see the paradise of the world – Kashmir once again in its original form and beauty. Next Week Episode: KBC will have family special thus will not have individual participant on hot seat. * Haider is an adaptation of William Shakespeare’s trajedy novel Hamlet. It is the third movie in the director’s Vishal Bhardwaj Shakespeare’s trilogy, Maqbool (Macbeth), Omkara (Othello) and Haider (Hamlet). Shahid plays the titular role of Haider, and the movie also has Tabu who essays the role of his mother who marries her brother-in law (played by Kay Kay Menon) after the disappearance of her husband. Shraddha plays the role of a journalist Arshia who is Haider’s love interest. Haider the movie releases on 2nd October 2014 (Next Thursday). * Info on Shakespeare tragedy novel – Hamlet at its Wikipedia page and Haider’s movie Wikipedia page.